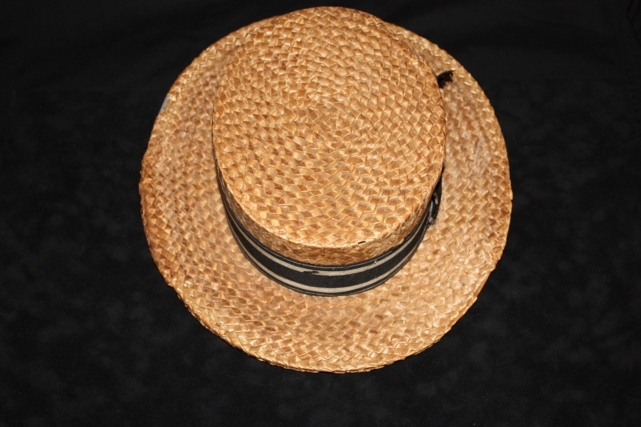 Al Capone's Personal Straw Boater? 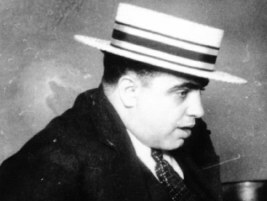 In Al's Capone's lifetime, he had worn many suits of clothes, but also had worn many hats. Here is one of his straw boaters taken from a Cicero raid. but some of the positive clues that really intrigued me are several of the factors that I will list below. Some things most people did not know. 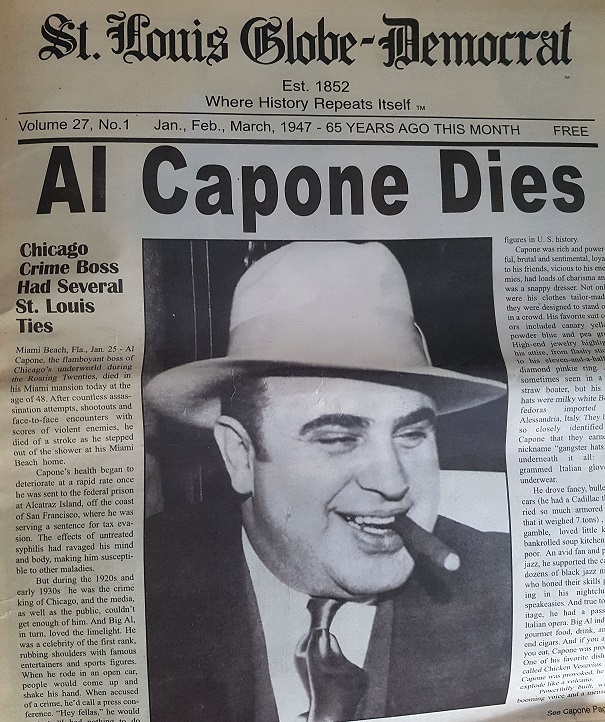 Prior to opening the once famous Capone's Chicago on Ohio street, reknowned Al Capone collector Michael Graham, had scoured high and low for any item on Al Capone he could find. Graham was no slouch and did his homework whenever obtianing these items. Today, I follow his lead and consider him sort of a mentor by following his footsteps in uncovering new stuff, not only on Capone, but also the Roaring Twenties of Chicago. As Graham had once wisely stated, Capone is just a small part of the goings on in Chicago at that time. 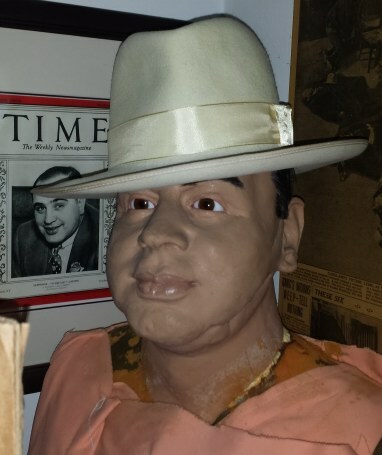 One of his main attractions for his museum that he had opened on June 25,1993, was a Al's famous cream white borsalino. Graham had acquired it sometime in 1990- 91, in a late night transaction at a Cicero restaurant, through a middle man for the seller. 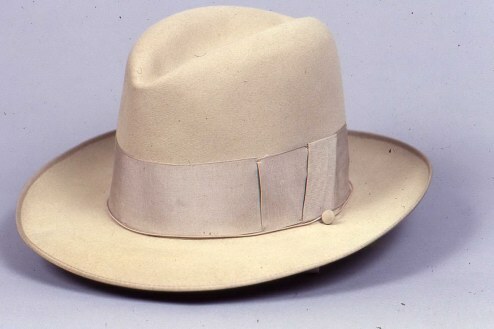 The hat's provenance seem to match up perfectly and the photos had the same exact particular and original hatband design to Al's custom hat. The cream white hat, who had once shone bright white under the extremely hot and bright powdered flash guns of photographers at Central Station, now had yellowed a tinge through 79 years of existence. Being a stickler for accuracy, Graham had passed up many past items he had deemed not authentic due to lacking backup documentation. Graham had even appeared on NBC'S Today show with Al's hat. 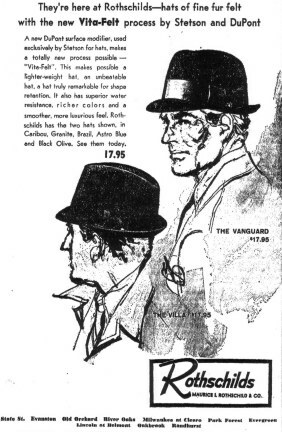 The Borsalino was originally purchased by Capone at the famous Chicago hatstore called Maurice L. Rothschild, which was situated at State and Jackson street on the South side of Chicago. (Today, the same building is still standing at 300 South State street, and is now a Walgreen's). 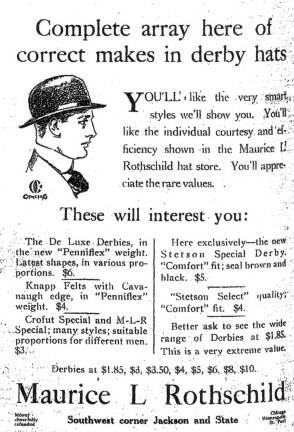 Rothschild leased the property back in 1905 and opened up his hat store circa 1915. He ended up owning the building there called the Rothchild building which housed clothing stores next to his hat store. 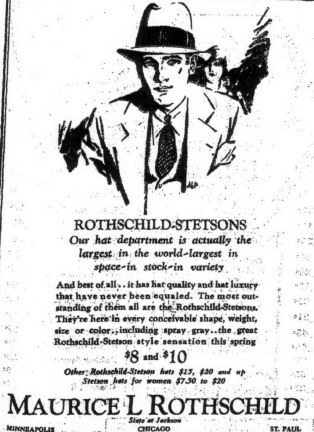 The Rothschild hat store opened other locations and the Chicago location was operational up to 1967. The Rothchild company ended filing for bankruptcy February 4,1994. 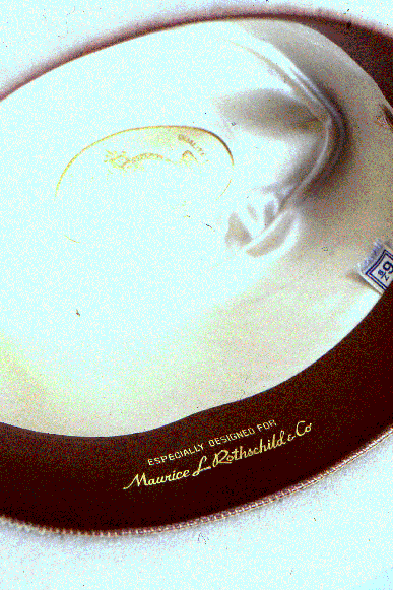 Maurice L. Rothschild hat ad's left to right; 1915,1931 and 1967. Through some negatives that I had purchased from my thankfully over collecting author friend Bill Helmer, I finally had a view inside Capone's famous hat, this from actual photos that Graham had professionally shot. 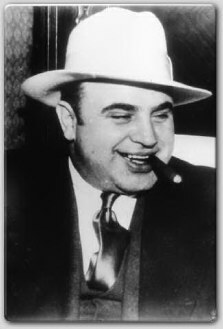 Nobody, besides the original owner and Graham knew what hat size Capone wore. Sadly, this hat is no longer in Michael Graham's possession and is believed in a Chicago storage somewhere. 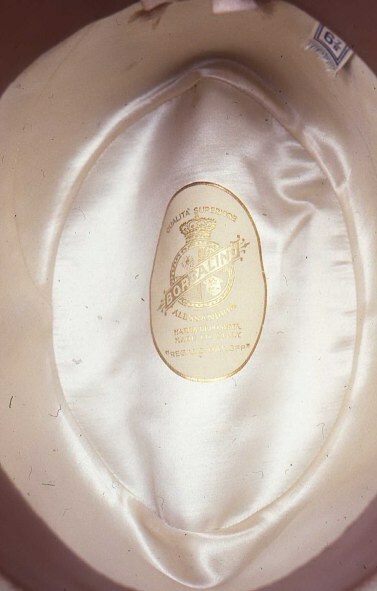 Al's head size tag in his famous Italian Borsalino especially made for the Maurice L. Rothschild Chicago store. Al's head size is confirmed as 6 7/8. Some people thought Capone was huge, which may seem to be added through his notoriety. Newspapermen and book writers were using word's like "Mastadon" and rivals were calling him "the Behemoth". In the mid 1920's to early 1930's, Al was noted standing at 5' 10" and weighing 250 pounds. This was considered really big in those days. Today, with basketball players hitting 7' 5", that is considered way small potatoes. I had once read about Al's Chicago home as being quite spacious and roomy, but when I actually walked through it, I felt it small with the hallways quite narrow. That's why it is important to remember that things are not sometimes as they seem or being recalled. I think Al's smaller head size may have also accentuated his big body mass, thus making him seem bigger. Rival George Moran had the opposite effect in some photos seen of him. His head size seems much bigger than his body, leading one to believe that he was small in stature, which was not at all the case. Notice how Al's hat is rested back with at least 2 inches above his eyebrows. Different from what is shown in gangster movies where you could hardly see the gangster's face because of the fedora covering one eye. 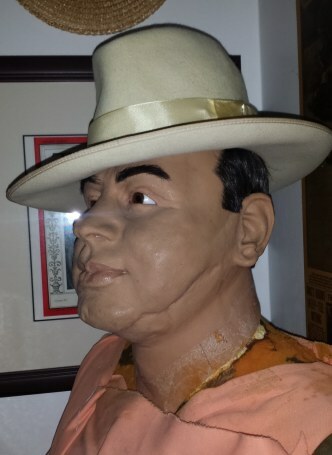 Replica of Al's famous cream white Borsalino on Niagara Falls wax museum figure. Some wonder as to 6 7/8" size for a man like Capone who was 5' 10" and weighing 250 pounds. I found out by asking hat wearers out there that there are many men of various heghts and weights that have 6 7/8" as a hat size. The person's weight and height do not always affect the person's head size. One important thing to note is how the hat maker (milliner) or hatstore took his measurements. Back in the day, the fashion of wearing a hat was slightly tilted back and just resting on the head. Garrett Wonder, a hat expert and collector had this to say on the hat size " I myself am 5' 7" and weigh 180 pounds and wear a size 6 7/8". The reason that Al could get away with wearing a size so small is that he wears the hat so high on his head (common for that time period). 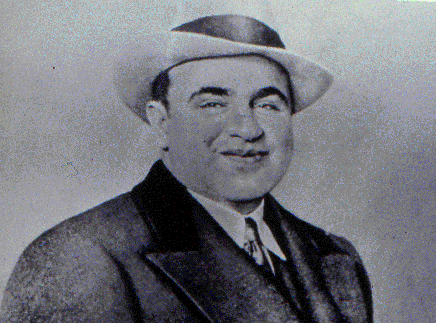 When hatters take measurements for a custom hat, they measure 1 inch or so above the eye brows, but if you look at Al Capone's photos en route to Atlanta, he wears the hat much higher on the head and at an angle. I would guess that if Al was measured in modern times (modern hats are worn much lower on the head) that he would be between a size 7 (22" circumference) and a 7 1/8 (22 1/4" circumference)." 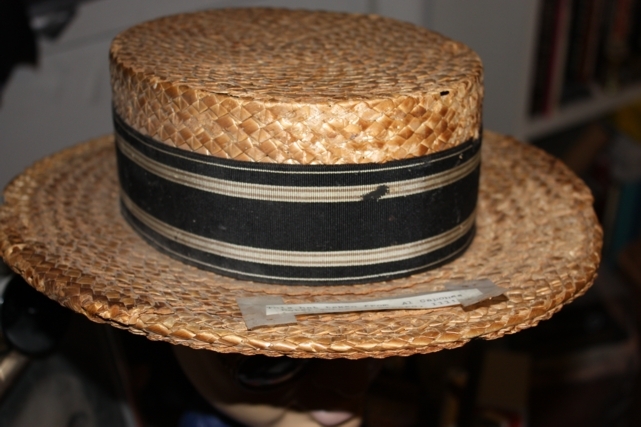 The straw boater was in two collector's possessions. They have both since passed on before the hat ended up here. 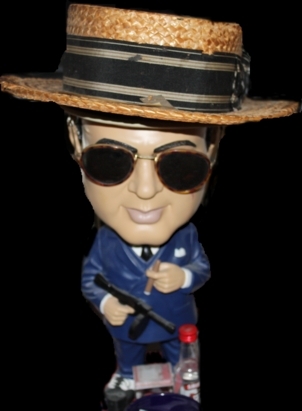 It was originally obtained before any Capone collecting craze, or through any resurgence in popularity via the gangster movies of the late 80's, such as "The Untouchables", or any of the latter day Capone bio books. This in itself, lends great credibility to the item. 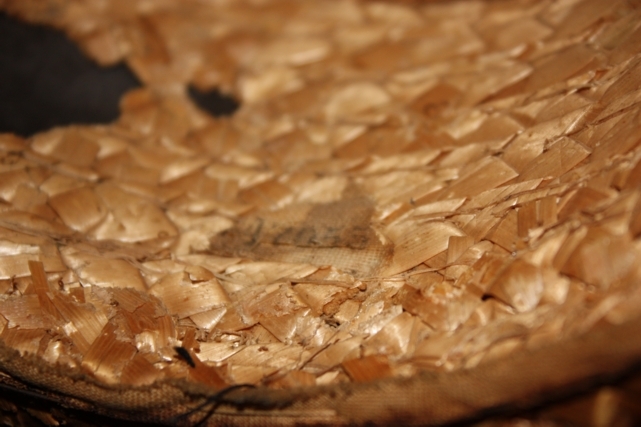 The hat's age (85 years), has left it very fragile and brittle. 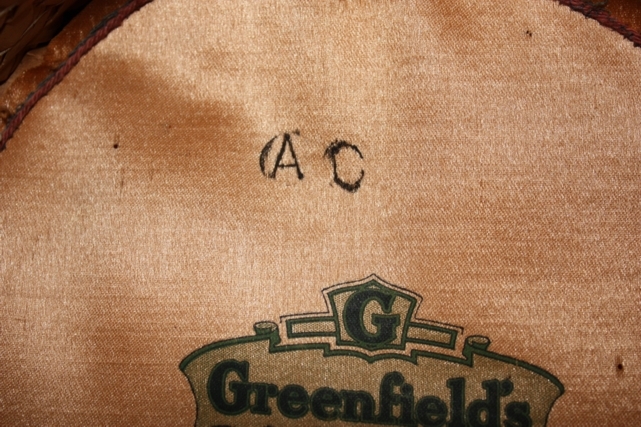 When viewing the boater, I was of course not overly estatic about seeing A.C. stamped inside the hat. Looks authentic but, this could have been put there by anyone. What I did find interesting was that the hat was from a St. Louis hat store. 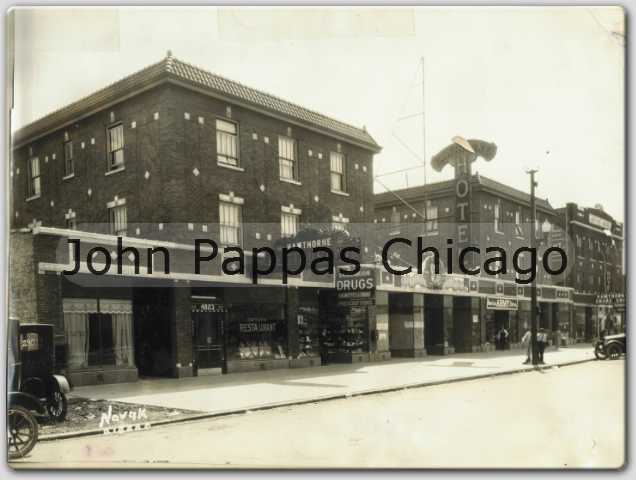 Many gangsters had hailed from there and the Capone crowd had great connections. It wouldn't be impossible for Chicago gangsters to go to St. Louis and buy one on a visit there, or even have one imported to Chicago. A faker would have most certainly have thought to get a hat with a Chicago hatmaker's name or a Cicero hat store to make it look authentic or at least believable. So the St. Louis provenance made it quite interesting to me. What finally clinched it for me was seeing the hat size tag inside the boater. Remember that up til this moment, no one knew Al's hat size besides Graham, and the person he originally got Capone's hat from. That is, until I got a peek inside Al's famous cream white Borsalino through those positive slides intelligently taken by Graham. It had the size tag listed at 6 7/8. Bingo! And there you have it! The boater also has the exact same size of 6 7/8! Al Capone's Cicero was invaded on several occaisions. Any of the raids could have stumbled across this hat. My opinion leans more towards the first raid. On Saturday, May 16, 1925, (Kentucky Derby Day), Reverend Henry C. Hoover, who was head of the West Surburban Ministers and Citizens association, lead a charge against Al Capone and his gangsters by attacking their vice dens. Hoover and his mob go to 4818 West 22nd street. On the ground floor, they go through a cigar counter with several chairs. They come face to face with a man claiming to be the owner named Joseph Smith. In reality, it is none other than Al Capone. He had just awoken from his afternoon slumber in an ajoining bedroom and got up after hearing all the raucous. He is unshaven and hastily dressed. Upon reaching the second floor, the raiders find gambling paraphenalia worth several thousand dollars. They immediately confiscate and cart away the equipment along with other personal items. Chester Bragg, a insurance salesman, is used as muscle to guard the door. Al tries to force his way in and succeeds. Bragg asks him "What the hell do you think this is, a party?" Capone replies that it should be a party, as he is the owner of the place. These words would get back at Capone 6 years later during his trial. Later Bragg is punched in the nose by Capone goons outside. Investigator David Morgan, who is a daytime machinist, is also beaten up outside by Capone goons. Reverend Hoover is asked by Al to layoff his places of gambling. Capone even goes as far as to tell the Reverend that he will get out of Stickney, if he leaves him operate in Cicero unmolested. Hoover turns a deaf ear, next Capone uses bribes, and finally intimidation. Capone's Hawthorne Hotel in Cicero. Raiders consisting of citizens found Capone across the street from the Hawthorne at a gambling joint run by Capone. Later police would also storm the Hawthorne hotel. This was probably to show the public that the police were attacking the gangster problem that was emerging in Cicero. A warrant will be put out on Capone for this bribe and threat. Nothing will come out of it though, but the story of raid will resurface in 1931, during his tax trial painting a picture of guilt as being an owner of a profitable gambling establishment. 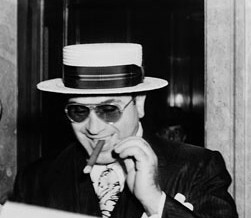 Capone claimed he had no income. 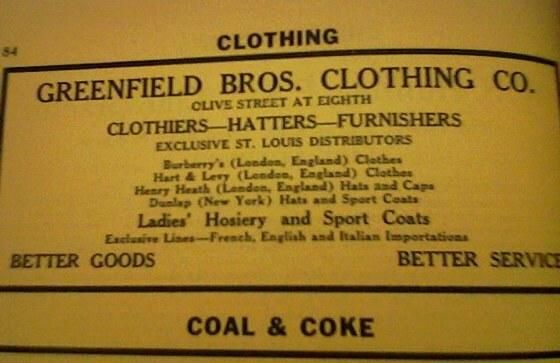 1921 St Louis Directory listing Greenfield's haberdashery. (Special thanks to St. Louis gangs author and researcher Mr. Daniel Waugh). 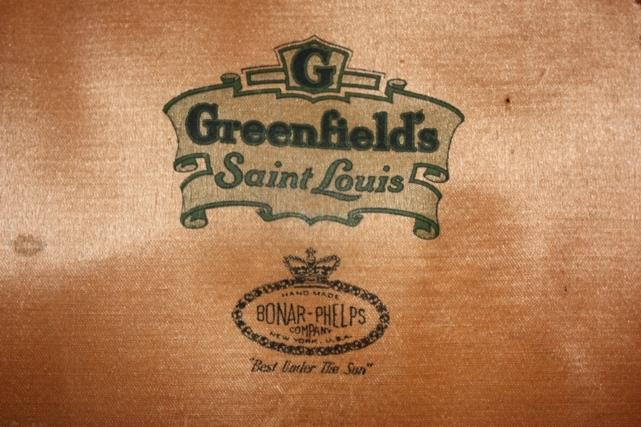 Bonar-Phelps from New York made this boater that was sold by Greenfield's in St. Louis. Bonar-Phelps motto for all their hats was "Best Under The Sun"
On July 7,1925, Cicero gangsters get their revenge on a past raider and shoot wounding David Morgan, the machinist who was employed as a chief investigator for the Minister's association. July 9,1925, Sherriff Hoffman, after complaints by citizens of being complacent with the gangster element, decides to raid several gangster hangouts. This is probably done for show. April 27,1926, Assistant State's Attorney William McSwiggin, is cut down in a hail of machine gun bullets. The authorities immediatedly spring into action and raid every gangster stronghold connected with Al Capone. One of the raids takes place at Capone's Hawthorne Hotel in Cicero. The place is combed for clues and people connected to Al. Hence any of these raids could have found this hat. In the late 1920's, merely stating outright to anyone, that you came across and took something belonging to Al Capone, without any permission, would have been a act that would have gotten you severely beaten up, and that's just to say the least. Hat came with a caption as coming from Al's hotel suite. Could be the Hawthorne, but most probably his room above his gambling joint (4818 West 22nd street ), where he was alseep when a raid took place in May of 1925. 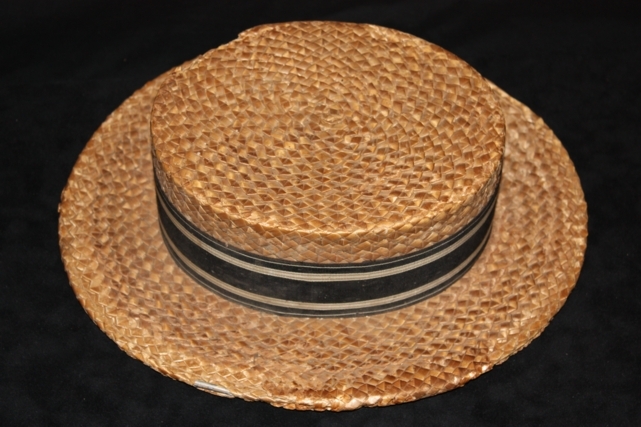 The straw boater dates to 1925, coming from a millinery and men's store named Greenfield's, in St. Louis. St. Louis was known as a gangster town with strong ties to Capone and his outfit. 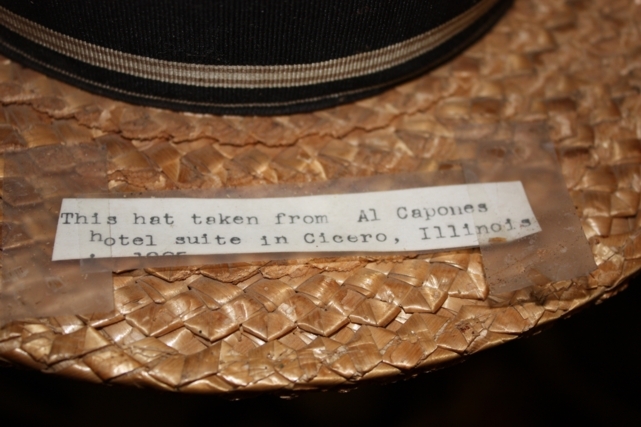 Many Capone hoods made the mistake of leaving hats at scenes of crimes with the hat maker's name and address hailing from Cicero. Many hoods circumvented this eventual trap by importing their hats from other cities and towns. Case in point was Mike Malone, who went undercover at the lexington Hotel. He knew this trick and specifcally wore clothes that were bought in Philadelphia to fool the Capone gang into thinking he hailed from Philly, just in case they checked his clothes. 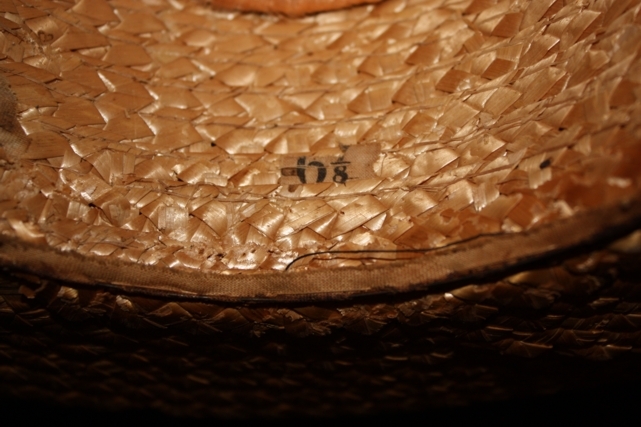 The hat contains the stamped markings A C.
These letters were put in by the hat store, so that the wearer could differentiate which hat was his whenever there was a big gathering with several men wearing the same type hat. In later years, a card stating the name of the owner could be placed inside the head band. Late 1920's photo of Capone with a boater. 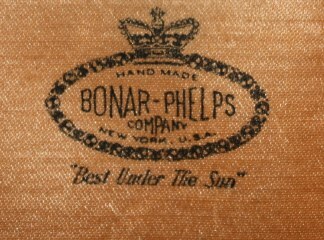 The Bonar Phelps insignia inside shows this was his favored brand. 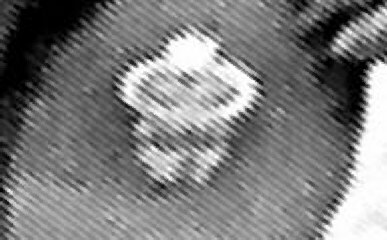 Oval crowned logo close up of Capone's inner hat taken from top photo, circa 1928. At left, inner hat of 1925 hat taken from raid in Cicero. Both are Bonar Phelps boaters. 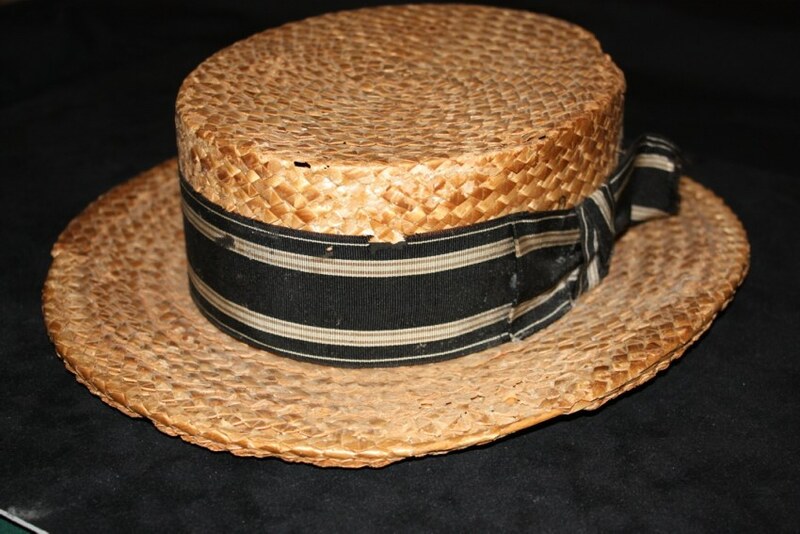 The straw boater got it's notoriety from barber shop quartets, but was actually originally worn by boaters to protect from the sun. The fad caught on with the gangsters who enjoyed this fashionable light hat that was worn only mainly from springtime to fall. In Florida, Al could wear it all year round. Al Capone had owned several of them. 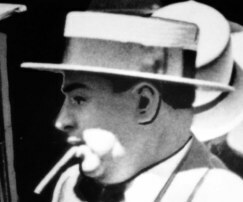 There are several photos of Al Capone wearing a stylish boater. In the 20's and 30's, French entertainer Maurice Chevalier wore the boater as part of his image and made it famous all over Europe. (Top) May 12,1929, (Right) June 16,1931, (Bottom) February 18,1941 and (Left) July 27,1926. 97055 Serial number in hat.